Safety is always job one on every work site. Most accidents or equipment damage happens when operators overlook important safety precautions or don’t fully understand how to operate equipment. That’s why Genie developed this two-part program, delivering a standardized aerials or telehandler training package, to help operators stay safe and fleet owners reduce their repair costs. 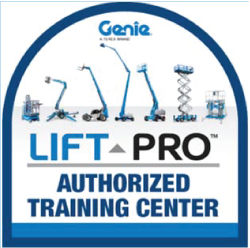 Genie® Lift Pro™ Online Operator Training Courses are high-quality professional‐grade programs that are delivered through a web‐based platform and are designed to satisfy the general training requirements for aerial work platforms as defined by ANSI, OSHA and CSA, and telehandlers as defined by ANSI/ITSDF, OSHA and CSA. The programs incorporate current adult learning theory and consist of detailed graphics, narration, video and a variety of quizzes that provide a rich and interactive learning environment for the trainee. At the end of the aerial program, there is a thirty question exam to verify knowledge retention. The telehandler course consists of a 57 question exam. Upon passing the exam, a certificate of completion is presented as proof of training in preparation for the hands‐on portion; after completing the online training, the trainee must receive hands‐on familiarization from a qualified person to complete the training process and become a qualified operator. 1. Call (855) 251-0423 to purchase. 2. Complete the general training anytime, online and at your own pace. Video, graphics and narration make it easier to follow and learn. 3. Complete a short hands-on training with your Genie Dealer for instruction and experience operating the applicable aerial work platform or telehandler models. 4. Receive your Genie Lift Pro aerial access card verifying completion of the training required to become a qualified aerial work platform or telehandler operator.